David Cotton is a husband and father of two college children and has served in the U.S. Air Force for almost 30 years. He now lives in Iowa and works as the Strategic Security Advisor for a cybersecurity consulting firm. David started working with Jesse O’Brien of Central Athlete in August 2018 after watching a Facebook live dialogue about nutrition between Jesse and Dean Pohlman of Man Flow Yoga. 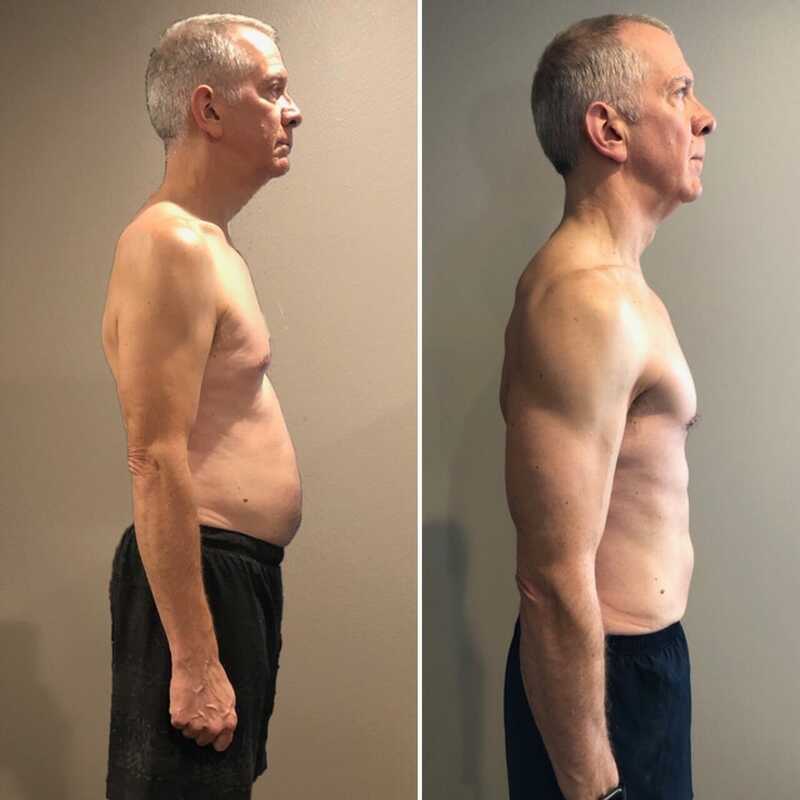 As a 59-year-old man, David was concerned about the rate at which he was losing muscle and gaining fat, so he sought action! Prior to Central Athlete, David was a member of Man Flow Yoga for over two years and dabbled in some dumbbell strength training as well. Since starting with Central Athlete in August, David has lost 13 pounds of fat and gained 4 pounds of lean muscle mass, bringing his body fat percentage from 17.3% to to 10.4% in six months while also focusing on building a strong foundation that creates lasting change. David has found that sticking to a solid routine has worked best for him. He wakes up at 5 am to take care of his dog, and then they both head to the gym—either his home gym or his local gym for the use of more equipment availability. He enjoys the solitude of his morning training routine and continues to focus on getting to bed at an appropriate time to support his early morning workouts and body composition goals. The addition of personalized nutritional guidance has been the key to David’s success. He and his coach continue to have ongoing discussions about his caloric needs and the types of protein, fats and carbohydrates he should consume each day in order to meet his goals. David’s only regret is that he does not live in Austin in order to receive the full Central Athlete experience and community. But he goes on to state that he is a full-fledged believer in the approach CA uses to work with their remote clientele. “I wasn't sure if remote coaching would be effective. My progress has exceeded my expectations so I am a full-fledged believer in this approach. My concern was that I wouldn't get the detailed advice and guidance on how to perform a workout or new movement, but that was easily dispelled in how my coach puts together the weekly and daily program. Each day the program includes instructional videos on how each exercise is to be performed. Additionally, the app that the coach and client use (TrueCoach) allows me to review previous times I’ve performed a task, the feedback I received, as well as the weight, reps or times I recorded so I can set a new target. Fortunately, Jesse at times will provide me with the challenge of more reps, faster speed or more weight based upon what he feels I am capable of performing. If you are feeling frustrated from putting in the hard work but seeing few results, it’s time to try something different! Click the link below to talk to a Central Athlete coach about personalized fitness and how a holistic approach that focuses on YOU could be the missing link.